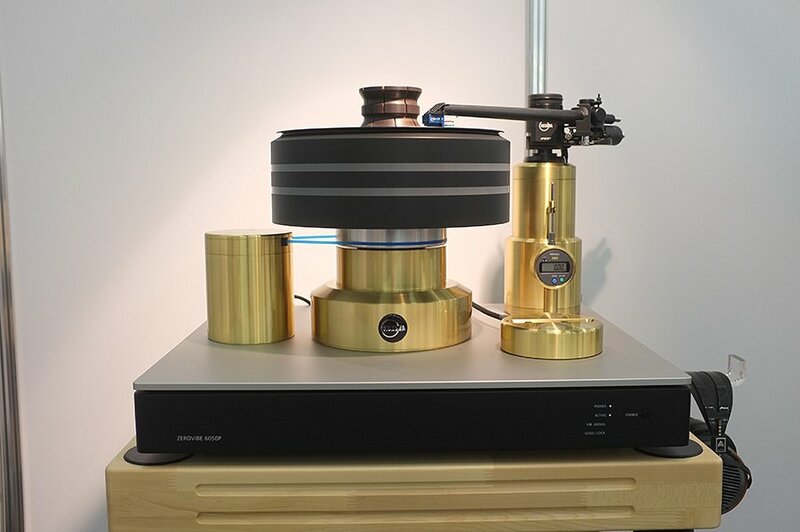 The Sperling Audio L1 heavyweight is completely manufactured in Germany, weighs somewhere between 50 and 60 kilos and consists of a massive aluminium support on which you can have both 9” and a 12” tonearms fitted at the same time. 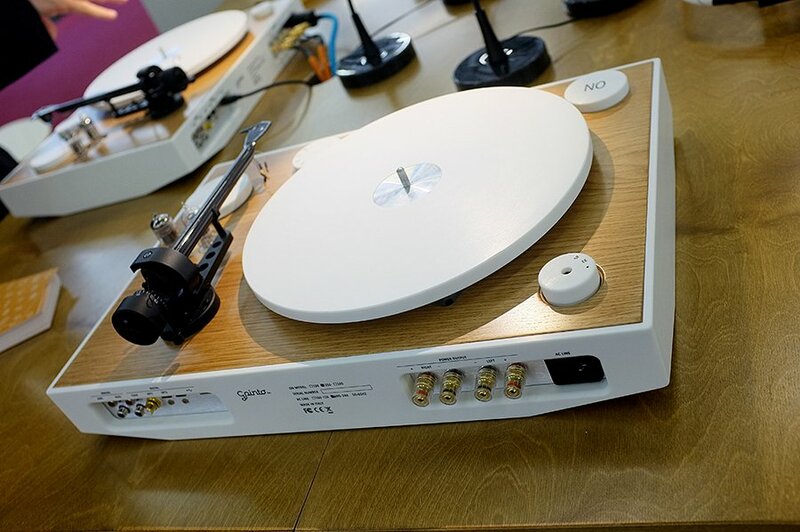 Well loved British brand Rega had a large and interesting display of their classic turntable designs as well as an interesting queen special edition fans of the band will be able to spot in the photograph. 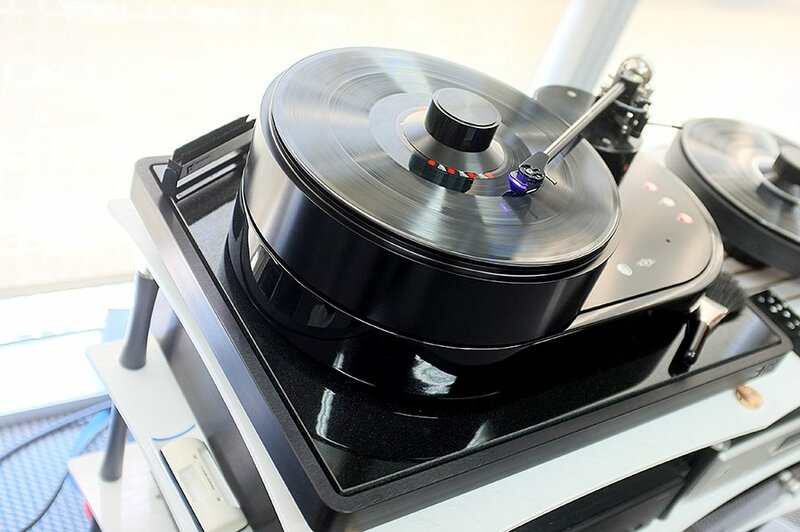 Analog Manufaktur Germany make the Giro turntable and the Viella V12 turntable, pictured here with the DS Audio Master 1 cartridge. All machining for the V12 is done in house at the companies factory located North of Munich. 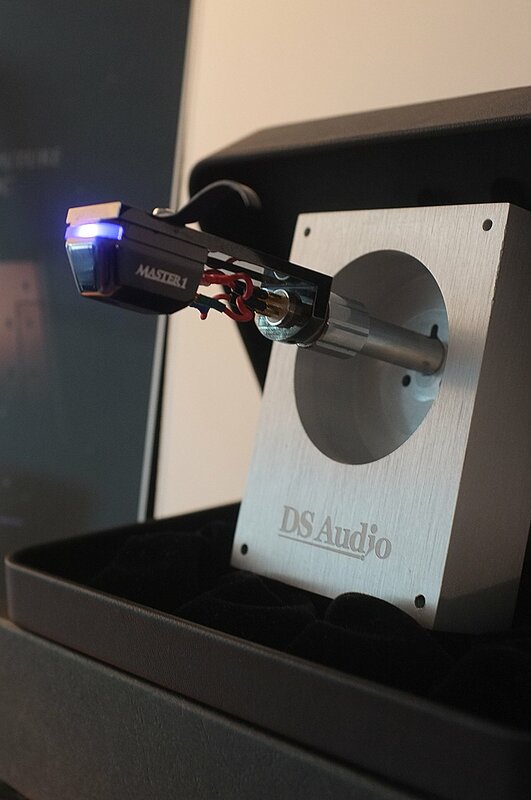 The DS Audio Master 1 is an “optical” cartridge which detects stylus vibration using a beam of light. 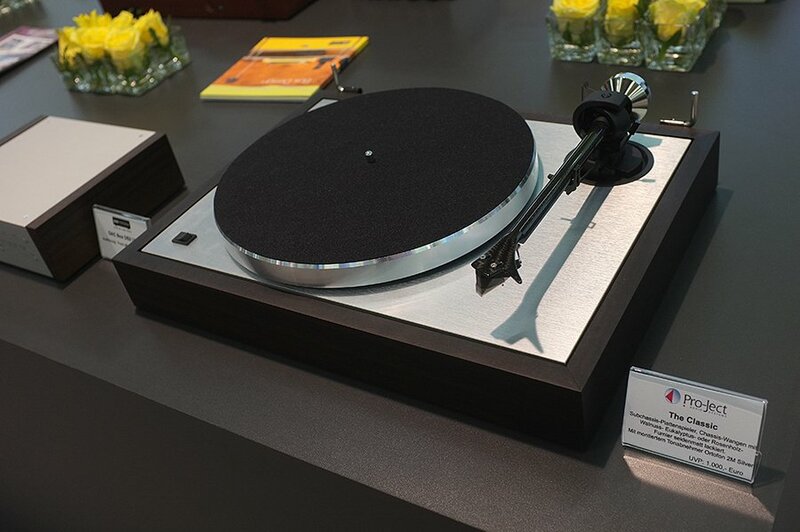 Acoustic Solid make a wide range of turntables and was founded in 1997 in Germany and originally called E. Wirth Partnership where turntables were made by the founders in their basement and garage. In 2001 they began construction of new premises in Altdorf. 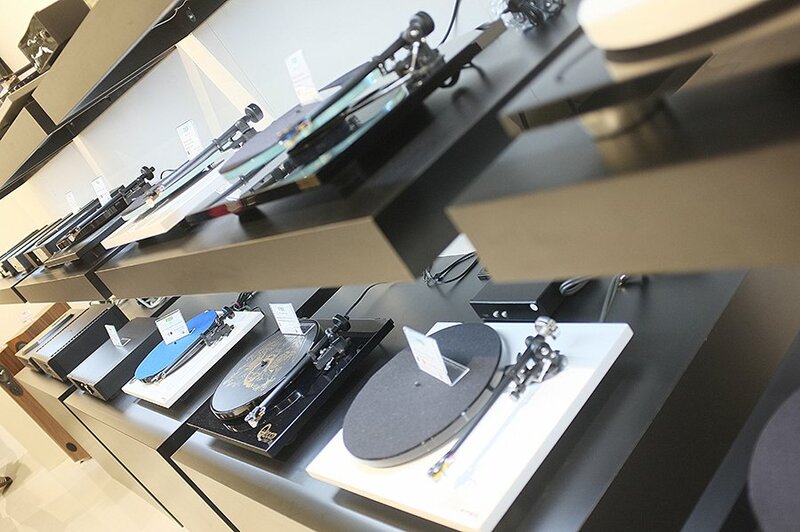 Their turntables are exported to 35 countries with Asia and Japan providing the core markets. 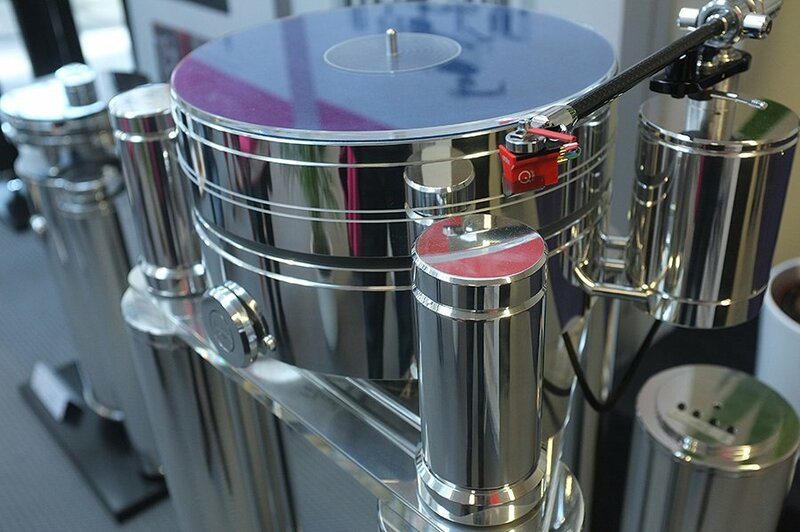 Another well known German brand, Clearaudio make some of the most stunning looking turntables in existence, including the phenomenal Statement. 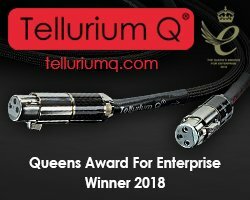 However, they don’t only cater to the high-end luxury market and produce much more affordable vinyl spinners, in this case the Performance DC which Hifi Pig reviewed in 2015 and awarded its highest accolade of Outstanding Product to. 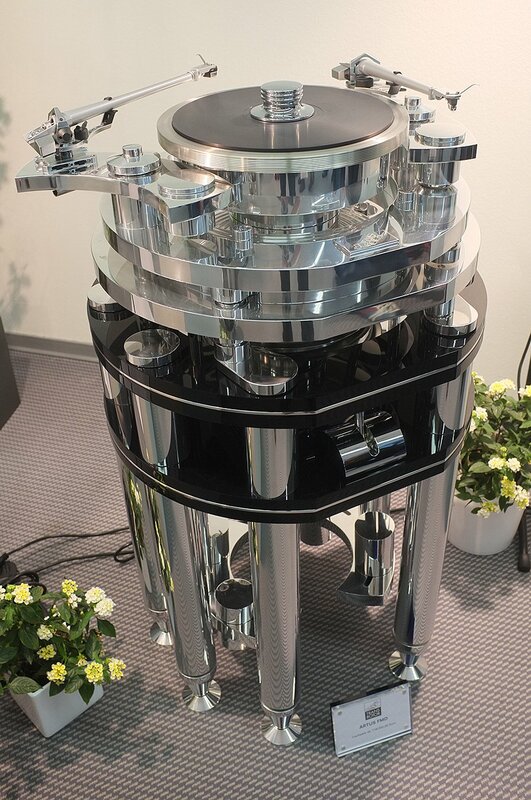 Another German turntable manufacturer is Trans Rotor that make a wide range of turntables including this behemoth, the Artus FMD. It features Transrotor Free Magnet Drive, Rotor Ring, Cardanic suspension and weighs a phenomenal 220Kg. 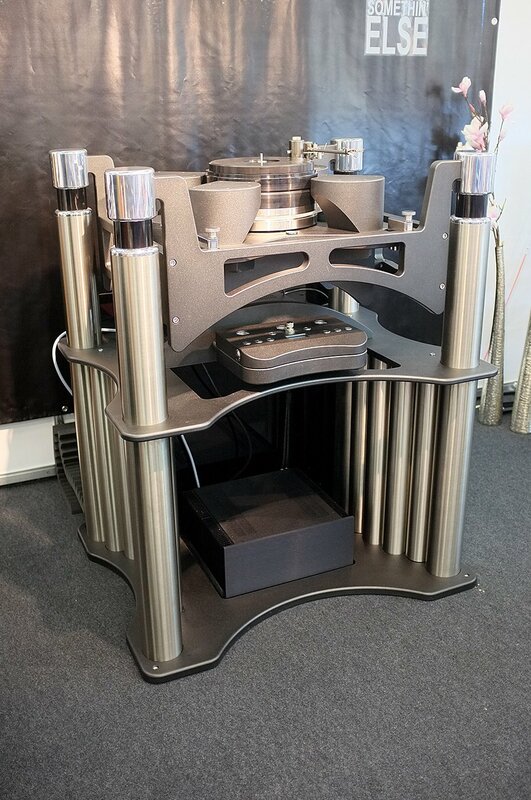 WE Audio Systems is based in the Black Forest region of Germany and market their turntables with the brand Perpetuum Ebner. 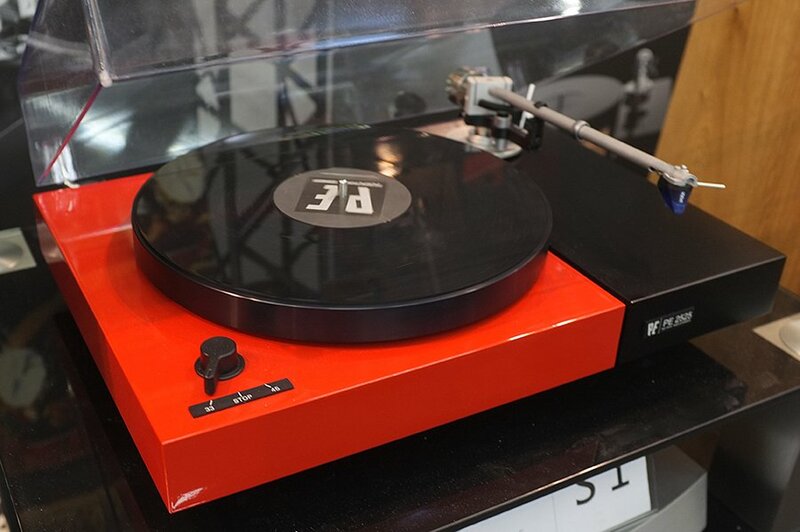 The company was founded way back in 1911, though the company’s website wants to give little away about the PE 4040 turntable pictured here. 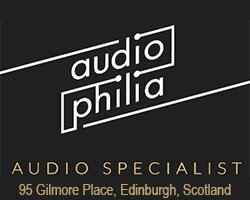 Well Tempered lab say they have just one goal, to give you maximum enjoyment from your analogue record collection. 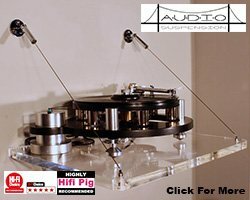 Pro-Ject have a great reputation for producing great value audio gear including a huge selection of turntables. 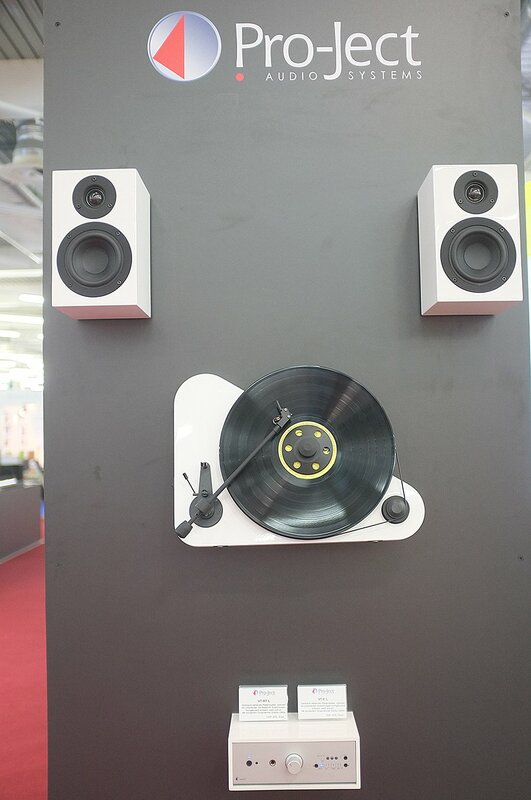 As well as the interesting looking wall mounted turntable system and their signature vinyl spinner, they had on display, they also introduced the Classic turntable which Hifi Pig got to take a sneaky peek at. 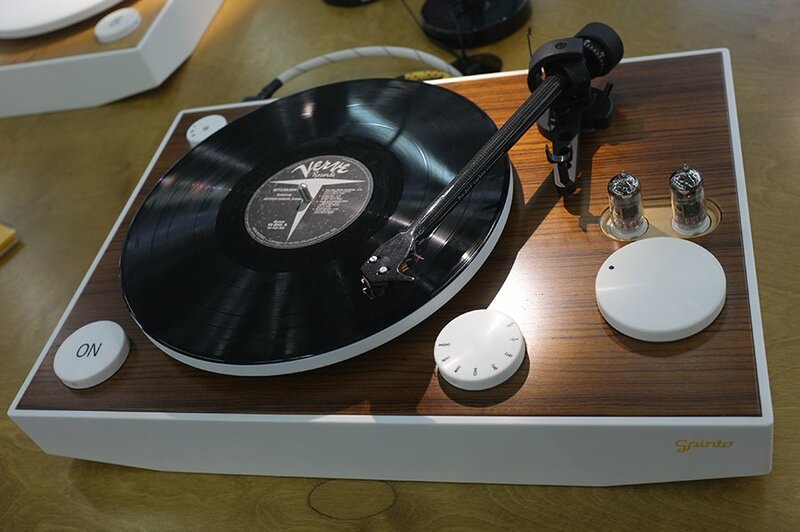 SPEC is from Tokyo in Japan and produce a small range of amps, phonostage and this turntable, the 8000 EX. 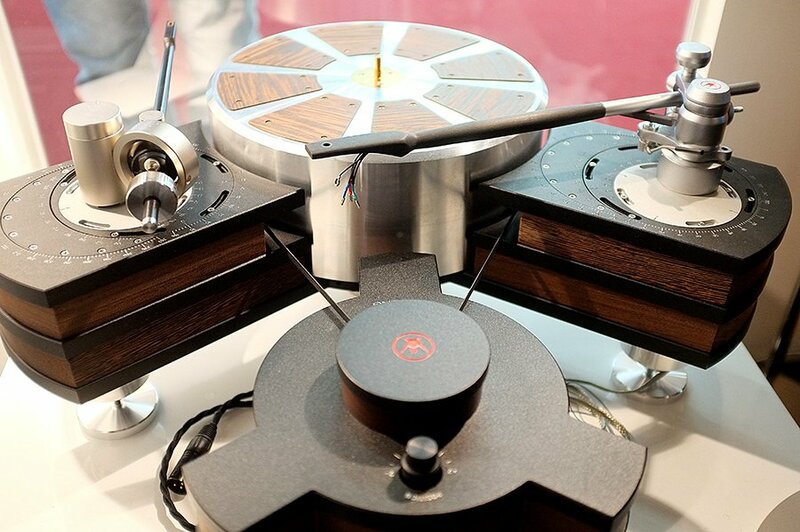 Essentially you have a very simple turntable of the deck itself, the motor and a string (rather than a belt). 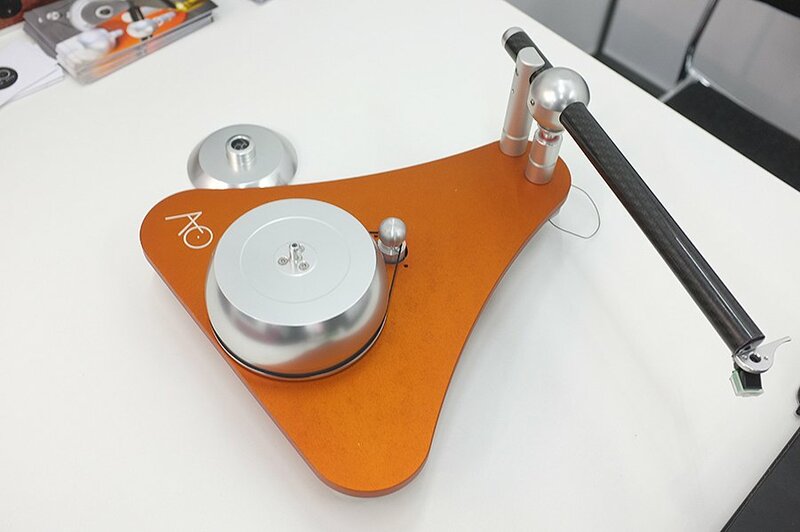 There’s a built in manual adjustment mechanism for the string tension, the platter is 40cm diameter and made of gunmetal, the bearing is a fixed rotating axis mechanism, to lighten the thrust load there is a “magnetic force aided structure” that can effectively reduce the platter weight by 30% and the motor is a DC core-less system. 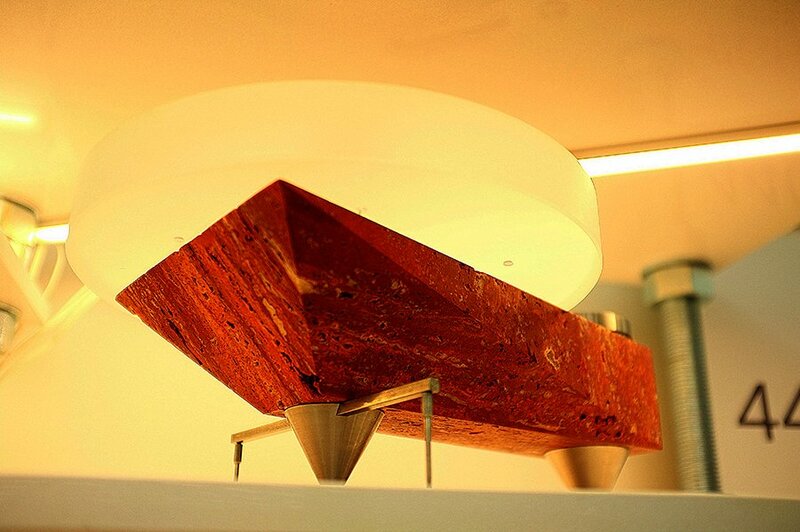 The chassis is made of Finnish birch laminated veneers. 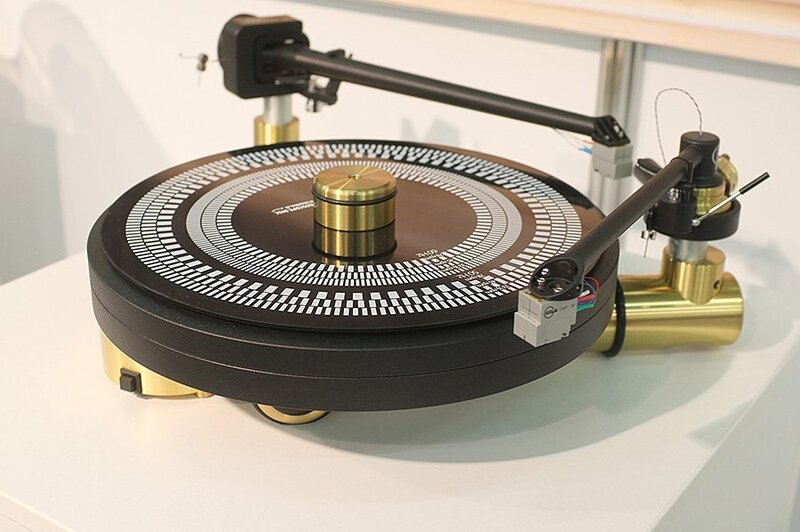 Acoustic signature make a total of twelve different models of turntables. 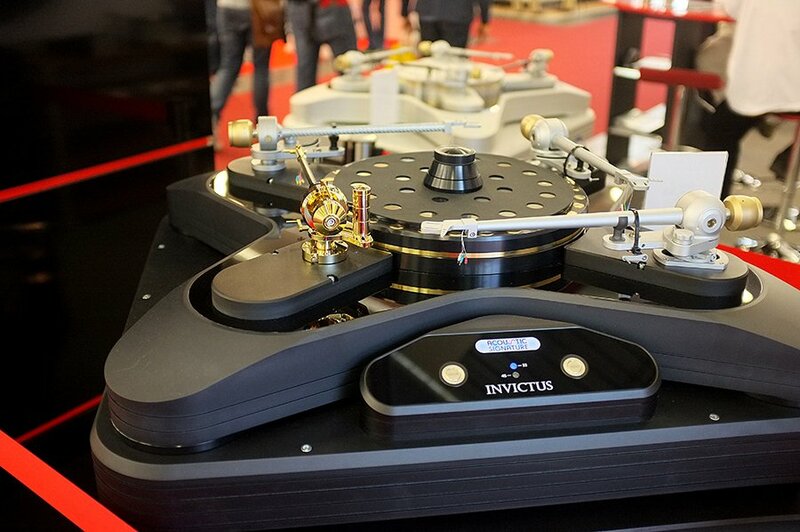 The turntable with four tonearms is the company’s Invictus whose shape is functional rather than for aesthetic reasons. It uses a total of six motors for its drive mechanism and it is said to run silent. 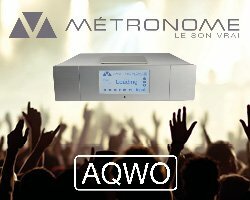 ON (Old / New) is the first plug and play turntable say this Italian company and is capable of managing all kind of sources, analogue and digital. 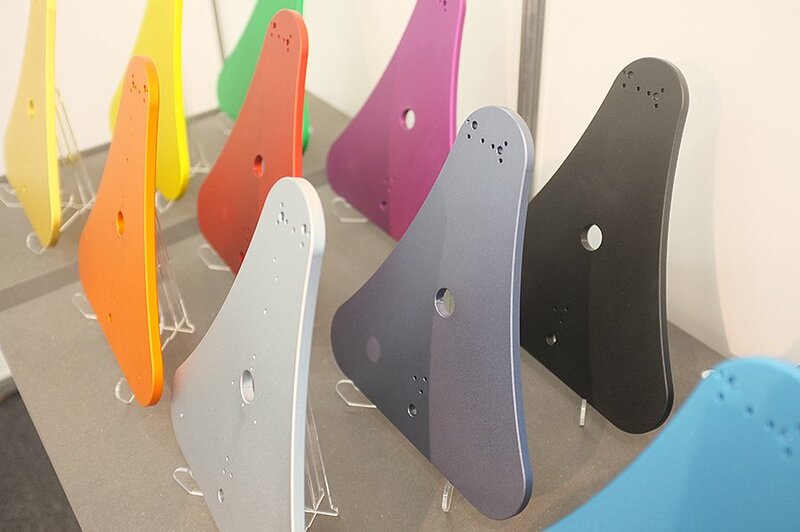 It can be connected to computers with a USB cable and to portable devices (smartphones, tablets and digital music players) via a Bluetooth® aptX® audio receiver. It houses a valve preamp with dedicated power supply and amplifiers from 100 up to 500 Watts RMS. 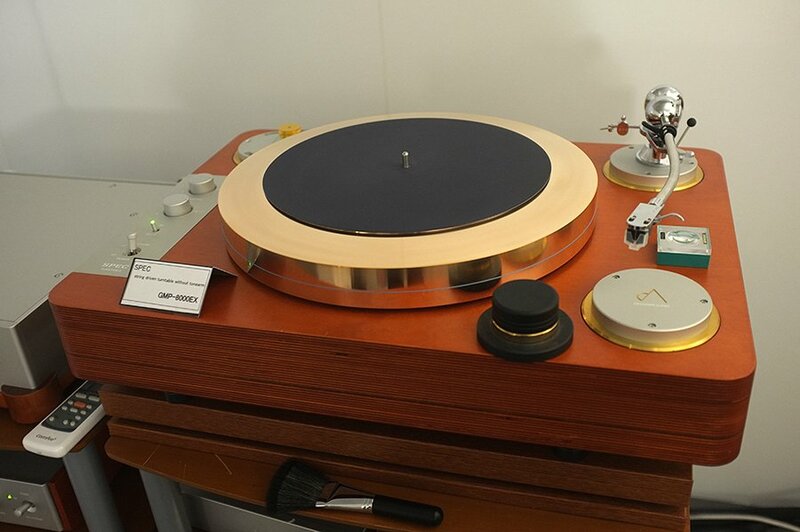 Slovenian company Kuzma have a cult following in audiophile circles and they certainly can make stunningly beautiful turntables. Pictured are the Stabi S and the Stabi XL DC weighing at 80Kg. 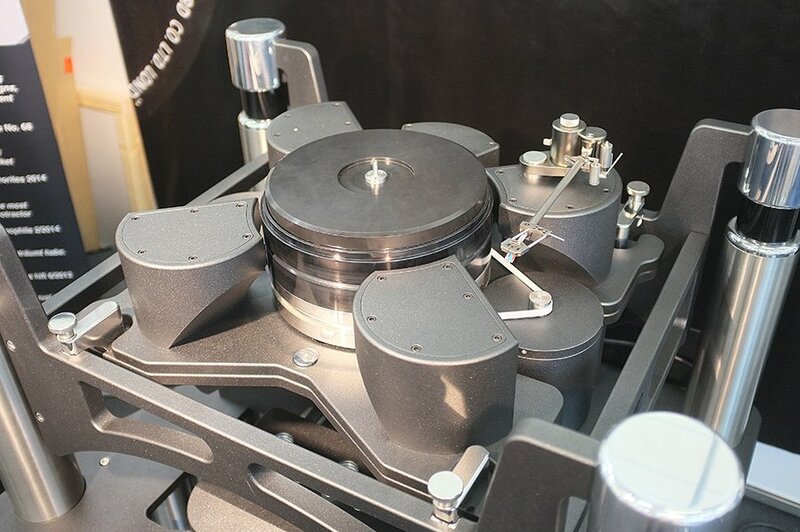 Sibatech isn’t a turntable manufacturer but exports Japanese audio products around the world. 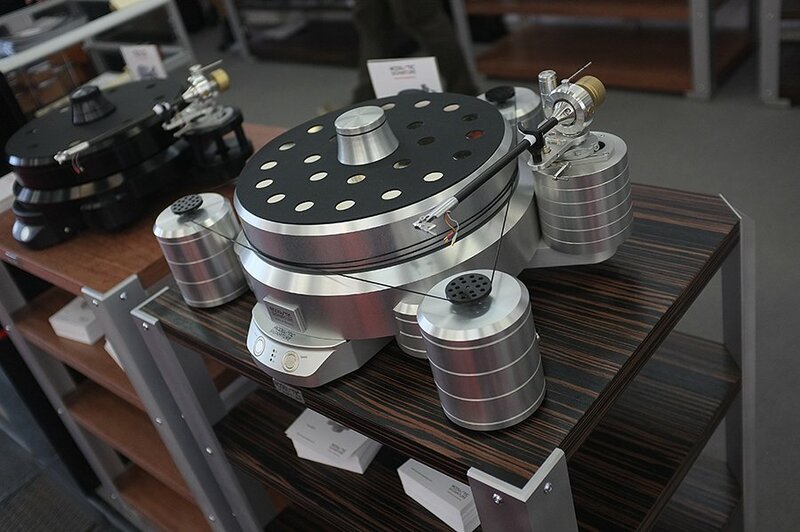 The first picture shows the uniquely shaped Abis SA-1 tonearm and the TA-1 tonearm. 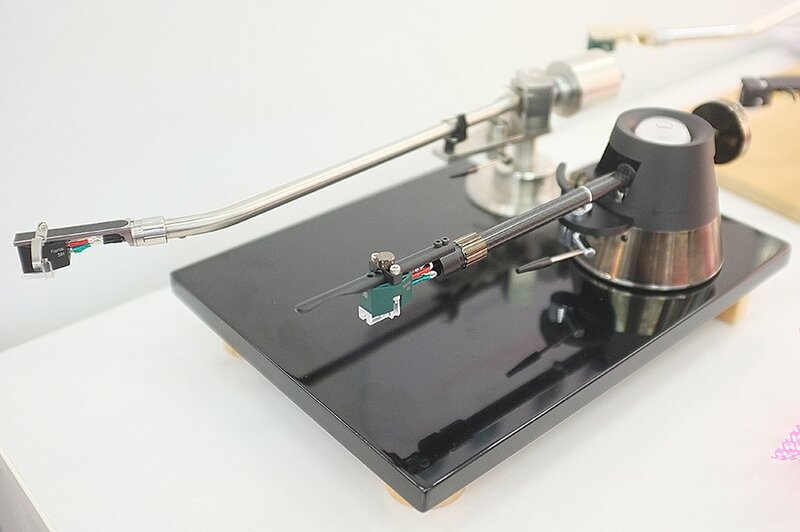 The second photograph shows the Viv Lab Rigid Float tonearm (the one with the cone shape at the pivot end) with an oil floated pivot and no offset angle structure. 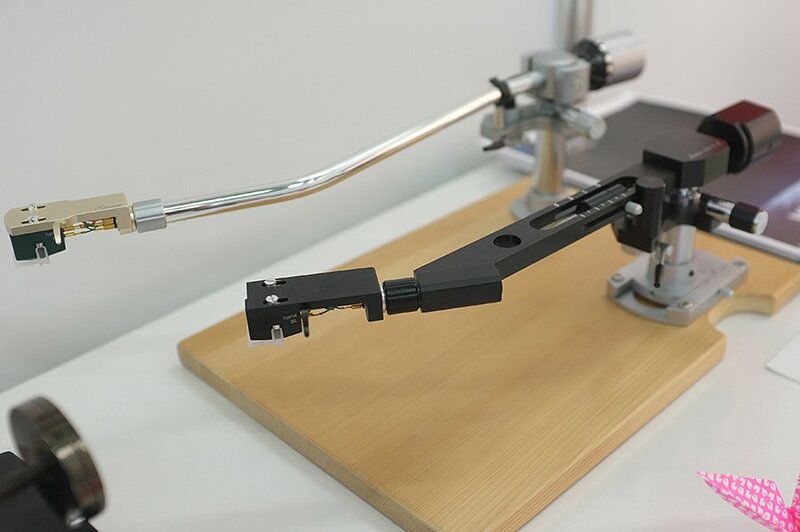 The arm requires no drilling of your plinth and the company says you can place it anywhere on your turntable…or even off your turntable. 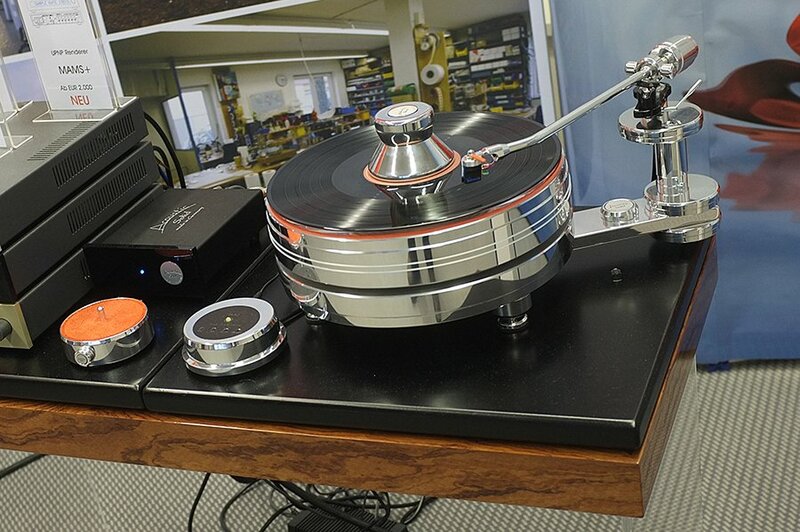 Both tonearms in the second photograph are carrying Hana cartridges which Hifi Pig reviewed here. 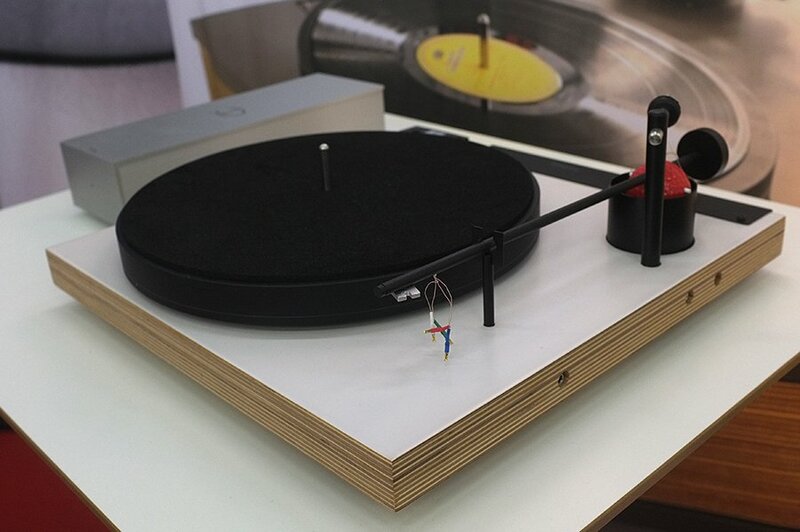 Last but not least is the Apolyt turntable from Acoustical Systems. 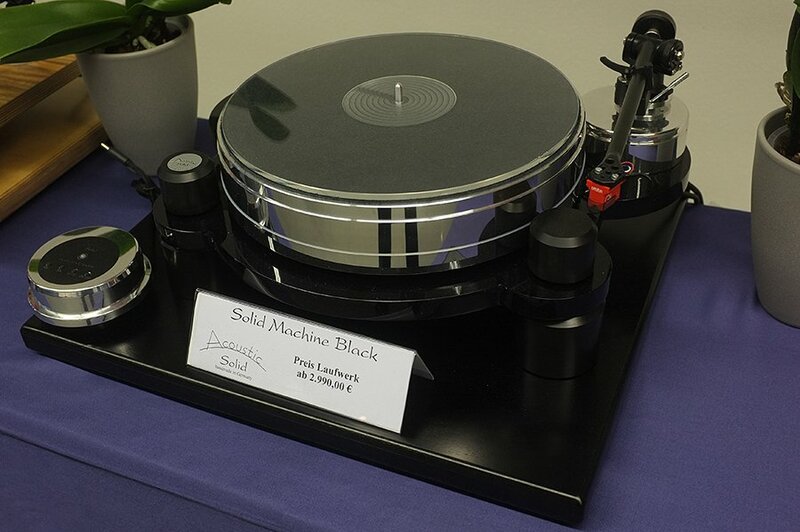 The turntable is designed by Deitrich Brakemeir and costs in excess of €250 000. 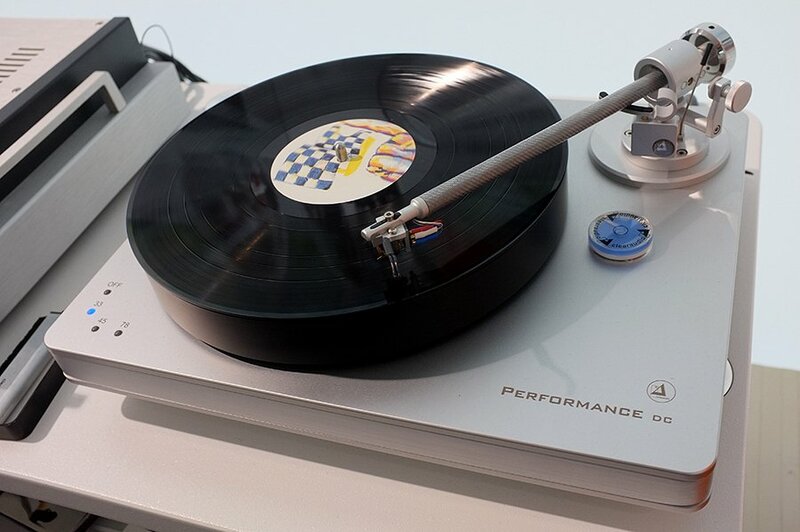 Onboard is a “full bi-radial aero-static true air-bearing” used for the first time in a turntable. 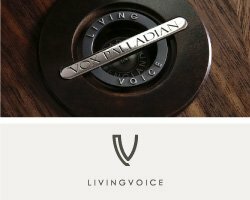 The platter itself weighs an incredible 110lbs and is made up of Delrin, three specific alloys, V2a stainless steel and HD18 Tungsten. The mass of this platter is exactly in the horizontal bearing axis which the company says results in a perfect resting mass concept of unparalleled stability. 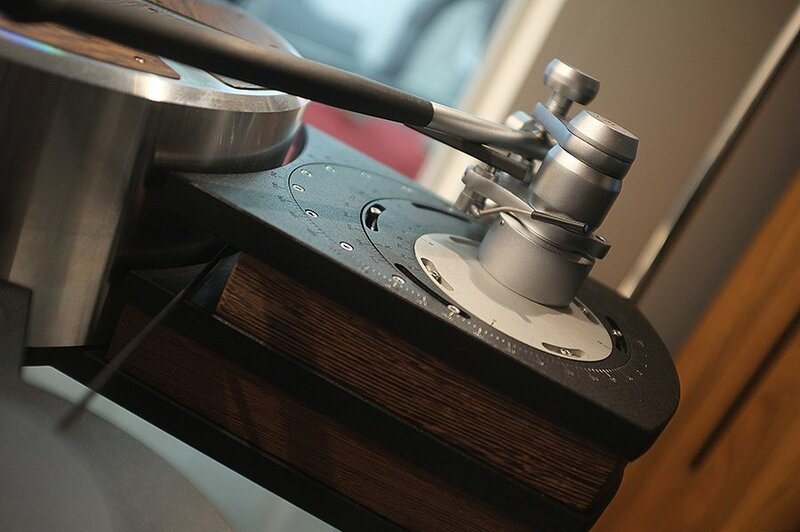 The platter has 38 times the inertia of any turntable ever made…no matter how large or how expensive. 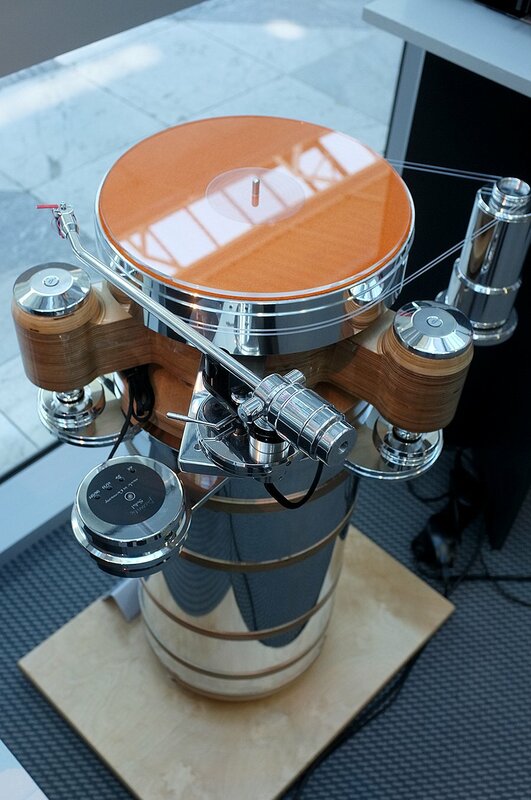 An air suspension system results in a resonant frequency of 0.5Hz designed to isolate the turntable from parasitic vibrations. The company say that so isolated is the turntable that you could jump from a chair next to the turntable whilst it is playing with no impact on the stylus’ tracking. The list goes on so better leave you with the tech spec.